Marguerite-aville: New & Improved *Ultra Concentrated* Blog! It's just like a blog, only ... less words! Like Ultra Concentrated dish soap. I can't guarantee that anything I say will be interesting, but I can guarantee that it will be brief. I'm hoping to offset the very unfortunate closing of the SETI Institute, which for years has sent out, and sought out, radio signals that attempt to connect with other intelligent life forms. 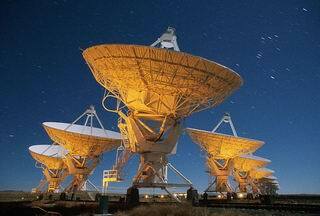 Sadly, if aliens are out there, they seem to be screening their calls. So far, nobody's picked up on the algorithms and coded messages we've been sending out into space. Probably because the mesages are bor-ing! And using radio signals?? You'd might as well try to contact the aliens on Friendster. Or MySpace. It'll be almost like having a blog.